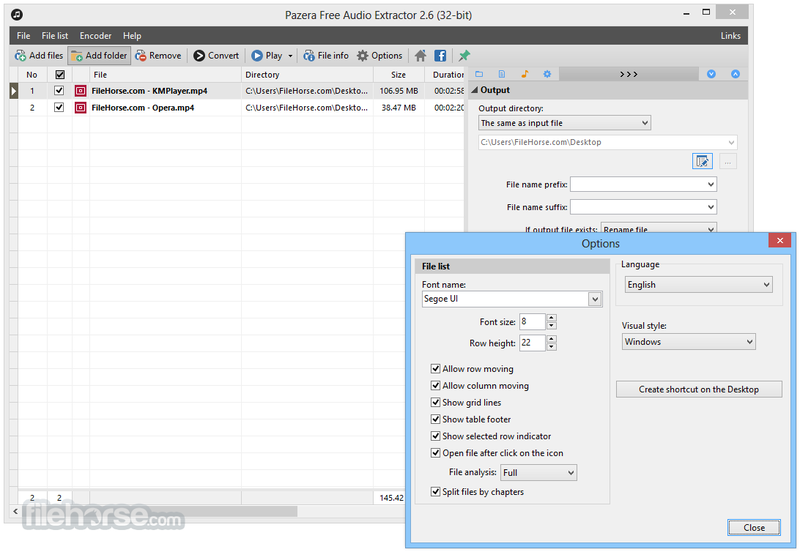 Pazera Free Audio Extractor is freeware application whose main purpose is to easily and without any quality loss extract audio tracks from video files. The extracted audio tracks can be converted to desired format MP3, AAC, AC3, WMA, FLAC, OGG, M4A (AAC/ALAC), WV, AIFF or WAV. The usage of the program is quite simple. Importing videos can either by file browser or by drag and droping files into the program window. Once the video files are loaded in the list you can specify the output format or pick one of many predefined profiles. Click at the convert button will commence the audio extraction and encoding process. This audio extraction or audio encoding process can be done in batch so you don't have to do it file by file. There are no limits of how many files you can process in batch. Closing down application or shutting down computer once the batch is finished is also possible. Advanced users can also change the audio bitrate, sampling frequency, audio chanels or easily increase or decrease audio volume. Pazera Free Audio Extractor also allows extraction or conversion of full audio track or selected range only. This is qute handy if you want to crop few seconds from the beginning or from the end. In case you want to preserve the original audio track pick "Try extract original audio stream" as output format and the program will try to extract the audio track without any format conversion meaning that the output file will have absolutely no audio quality loss. The application also allows you to load audio files and it can be used as free and easy to use general audio converter.